Discovery requires thoughtful planning on how to search for electronically stored information, conferring with the opposing party on search methodologies, and following stipulations on designating ESI as Attorney-Eyes Only (AEO). The Plaintiffs in Youngevity Int’l Corp. v. Smith produced 4.2 million search term hits, designated them all AEO, and failed to produce another 700,000 records after the close of discovery. There are many valuable life lessons from this case. The parties originally had a three-step discovery protocol where 1) each side would propose a list of search terms for their own documents; 2) each side would offer any supplemental terms to be added to the other side’s proposed list; and 3) each side could review the total number of results generated by each term in the supplemented lists (i.e., a ‘hit list’ from third-party vendors) and request that the other side omit any terms appearing to generate a disproportionate number of results. Youngevity Int’l Corp. v. Smith, 2017 U.S. Dist. LEXIS 210386, at *9-10 (S.D. Cal. Dec. 21, 2017). The Plaintiff deviated from the discovery plan, instead producing every document that was a hit to a search term. If the Plaintiff had provided the Defendant with a search term hit report, there could have been a narrowing of the search terms to reduce the number of hits. Youngevity, at *31. Magistrate Judge Jill L. Burkhardt stated the Plaintiff conflated “a hit on the parties’ proposed search terms with responsiveness.” Just because a record is a hit to a search term, does not mean the record is also responsive to a discovery request. Youngevity, at *33. The Court explained “[s]earch terms are an important tool parties may use to identify potentially responsive documents in cases involving substantial amounts of ESI. Search terms do not, however, replace a party’s requests for production. Id. This was illustrated by the Plaintiffs producing UPS tracking emails and notices to clean out the refrigerator, which were clearly not responsive to any requests for production. Id. The Court found that the Plaintiff failed to meet their discovery obligations by their refusal to honor their discovery agreement on search terms, producing every search term hit, designating all hits as AEO, and not conducting any quality control measures on their production. Youngevity, at *33-34. Option 2) By December 26, 2017, provide the not-previously-produced 700,000 documents to Defendant without further review; pay the reasonable costs for Defendant to conduct a TAR of the 700,000 documents and the July 21, 2017 and August 22, 2017 productions for responsiveness; by January 24, 2018, designate only those qualifying documents as “confidential” or “AEO”; by that date, any documents not designated in compliance with this Order will be deemed de-designated. The Plaintiff further had to pay for all reasonable expenses and attorney’s fees for the motion to compel and the Plaintiff’s failure to follow the protective order, including costs for negotiations and related Court conferences. Youngevity, at *39. 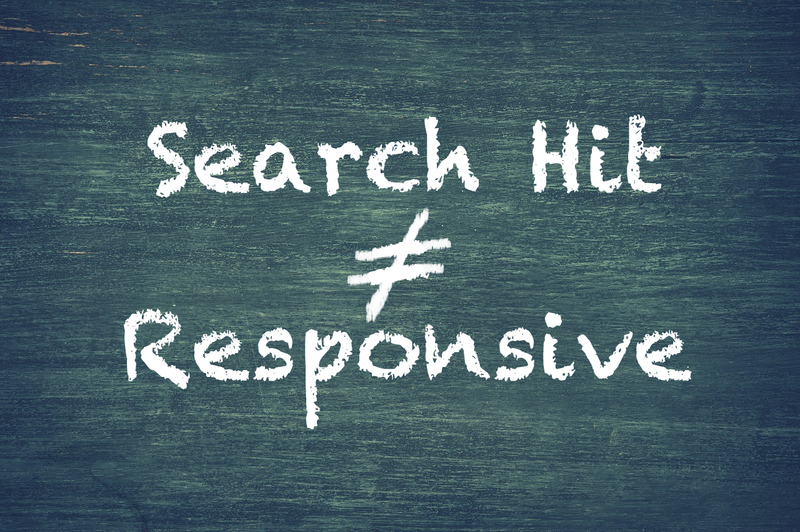 Just because ESI is a hit to a search term, does NOT mean that data is responsive to any discovery request. Moreover, designating all ESI as Attorney-Eyes Only should not be done as a tactic to avoid conducting document review. While it is possible that specific file types could contain trade secrets, those are usually files such as CAD drawings or other specialty design software. However, that is the exception and not the norm when it comes to designating ESI as Attorney-Eyes Only. Responding to discovery requests should not ignore requests for production. Parties often get lost in search terms, focusing on document review as process independent of the claims of the lawsuit. Lawyers should resist that quagmire and focus document review to respond to the requests for production. Developing searches is the first step in responding, however, a search strategy should not simply be keywords. Searches should be built with the requests, including date ranges, messages sent between individuals, and other methods to focus on the merits of the case, not document review for the sake of document review. The parties in the above case were encouraged to use technology-assisted review (TAR) multiple times by the Court. While the Court did not state what sort of TAR, whether it was predictive coding, clustering, email threading, de-duplication, or other advanced analytics that could help identify potentially responsive information, it great to see a Court encourage TAR to be used by litigants. 2017 had many lessons for attorneys and eDiscovery. On January 25, 2018 at 1000am PST, I am moderating the Everlaw Year in Review Webinar with Magistrate Judge Sallie Kim and District Judge Xavier Rodriguez. 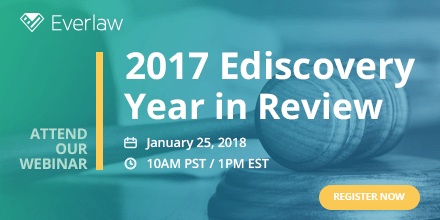 Both Judges will share their views on the top ediscovery court opinions from the past year, including thoughts on proportionality, narrowly tailoring requests for production, and compliance with discovery orders. I hope you can join us. For more information, please visit the registration page. Previous Post:Do You Really Need to Depose That Person?